Perhaps the only thing more creepy than a clown is a ventriloquist’s dummy. Made in our image but distinctly not human, dummies have left the safe confines of the puppet stage for our space, yet remain apart, giving voice to sentiments we dare not speak ourselves. At Diane Rosenstein Fine Art, celebrity photographer Matthew Rolston takes a closer look at these uncanny little doppelgangers in large, lucid portraits of 24 dummies from the collection of Kentucky’s obscure Vent Haven Museum. The images are exceedingly consistent: frontal, evenly lighted and cropped. They also reveal their subjects to be as individual and vulnerable as real people. Under Rolston’s eye we see the dummies, which date from as early as 1890, as unique, handmade objects, roughly whittled and painted in broad, slapdash strokes. They also show the marks of time, weathering the humiliations of cracking skin, lost hair and poor repair jobs that afflict all of us eventually. Some of them even have small holes near their eyes that look like mechanical tear ducts. Yet despite this individuality, they are in the end representations, holding a mirror up to the ways in which we categorize and stereotype. There is more than one Sambo-esque figure with black, black skin and thick red lips, as well as a very simian-looking “Irish Policeman.” They remind us that it’s as easy to evoke humanity as it is to strip it away. The first commission that Beverly Hills-based photographer Matthew Rolston ever received, in his now decades-long career, was for Andy Warhol’s Interview magazine—back when he was still a student at Art Center College of Design in Pasadena during the 1970s. Rolston went on to shoot top models, actors, and entertainers for Rolling Stone, Vanity Fair, Esquire, and other culturally prominent magazines during the 1980s, establishing himself alongside formidable colleagues like Herb Ritts, Bruce Weber, and Annie Leibovitz. 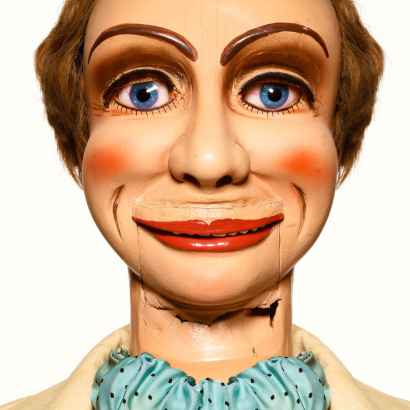 Rolston’s current exhibition at Diane Rosenstein Fine Art in Los Angeles takes a more deconstructed approach to portraiture in its playful substitution of the photographer’s typically headshots features some 200 ventriloquial figures—also known as “dummies”—from Fort Mitchell, Kentucky’s Vent Haven Museum. The eerily fixed expressions, hard and high-polished angles, and stone-cold gazes of Anonyma Boy, Uncle Eddie, Ditty Talk Hawkins, and Goldston Head I (all 2010) are presented in rich color and brilliantly fine detail. Rolston thus reveals the careful compositional techniques that characterize the best of contemporary portrait photography, by here animating the gloriously inanimate. And the realism of these striking pigment prints seems to perform the opposite aesthetic action of celebrity (which transforms living persons into static objects of admiration, scorn, or affection), inspiring varying responses to the likenesses of both orders of dolls, from delight to revulsion — at least among human observers. 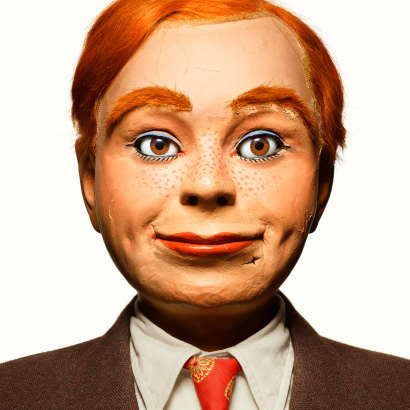 On display in Matthew Rolston’s exhibition, entitled “Talking Heads,” are large-scale color photographs of ventriloquist’s dummies. Rolston had access to the Vent Haven Museum in Kentucky’s collection of over 700 dolls, dummies and masks. With dates ranging from 1820-1980 the array of characters becomes a compelling catalog of not only doll making but the ventriloquists’ sense of self. 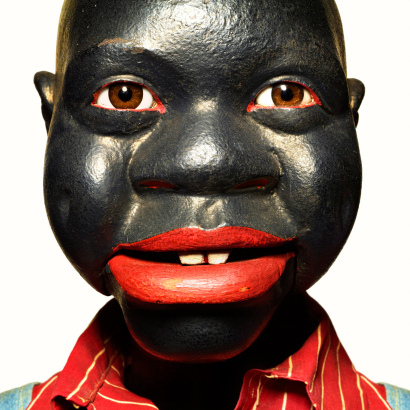 Each doll or dummy was photographed against a white background and is printed to a larger than life-size square. Installation view, courtesy Diane Rosenstein Fine Art. Photo by Craig Kirk. The details of the painted forms resonate emotionally as we encounter the differences in the expressions and the materials used for eyes. 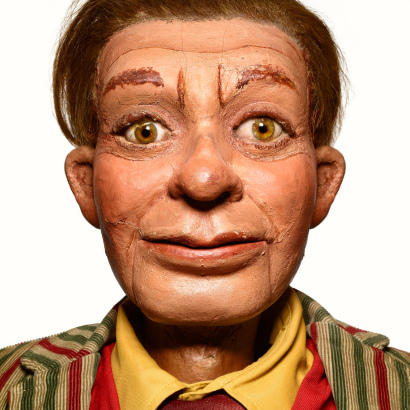 A quintessential ventriloquist’s dummy is a cliché – they are always more than just a doll with exaggerated features. Rolston’s images depict a range of figures with an attitude of compassion. Some are women, some are more animal-like, some have painted eyes while others are frighteningly human. The dolls’ vacant states are uncanny, holding your gaze but offering nothing in return. Like Irving Penn and Richard Avedon before him, photographer Matthew Rolston wanted a break from his usual way of working. Despite great success taking beautiful portraits of the beautiful people, or at least making them look beautiful, he yearned for a fresh challenge. It was found at the Vent Haven Museum, the modest retirement home for ventriloquists’ dummies in Fort Mitchell, Kentucky. 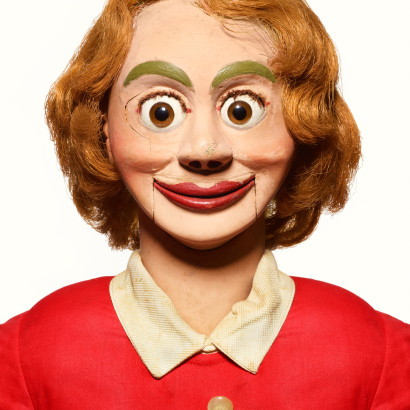 Billed as the only museum in the world dedicated to the art of ventriloquism, it promises rich material for a photographer, but Rolston did much more than document the strangeness of 800 life-like figures that once sat on a ventriloquist’s lap. Rolston approached them like celebrities in their own right, making portraits while applying the same rigor in lighting and composition that he would use for a living, breathing person. Each image is cropped tightly, a technique used by Andy Warhol, who actually gave Rolston his first assignment for Interview magazine. At Diane Rosenstein Fine Art, the walls are alive with the five by five foot (or three by three foot) color photographs of faces of great originality and character, faces that were modeled after funny or suggestive stereotypes of their respective eras. Some date to the 19th century such as the scrappy Irishman with bushy eyebrows and with reddened nose, others harken back to vaudeville such as red-lipped brunette Noisy Crachini, with her top-hatted companions Skinny Hamilton and Señor Wences. Most have names or identities. They were characters, integral to the performance of their creators, the ventriloquists. In these greatly enlarged photographs, framed in white, every crack, every bit of flaking paint is magnified, yet the eyes of each figure appear animated, even alive. Instead of treating the dummies as objects in a still life, Rolston portrayed them as subjects, reanimating them by way of his sympathetic treatment. When Rolston published these photographs in a book, Talking Heads, in 2012, he asked me to write an essay about them. I wrote, “If photography has the ability to freeze life as it once was, Rolston’s work here has another purpose: to suggest life lived once more.” These once beloved characters, now retired, seem so happy to have an audience again. Anyone who suffers from automatonophobia should approach Matthew Rolston’s new exhibition, “Talking Heads,” with caution. The photographer’s striking, monumentally scaled portraits of ventriloquist dummies do little to dispel the notion that these creepy-cool conduits possess some sort of human animus. In fact, Rolston’s loving images make a strong case that his subjects do indeed retain a measure of spirit and energy from the entertainers who once brought them to life. In 2010, Rolston set up a full-fledged portrait studio at the museum and captured each of his subjects from the same vantage point: square format, low angle, monochromatic backdrop, and a single light source. Fixated on faces, the photographs offer a window into what Rolston clearly believes is the soul of these transfixing figures. Long associated with glamorous celebrity imagery, music videos and television commercials, Rolston has of late been flexing his formidable imagination in a variety of arenas. In addition to highly personal projects such as “Talking Heads”—the gallery show is accompanied by a lush volume from Pointed Leaf Press as well as a short movie—Rolston has been working as a creative director in the hospitality and fashion worlds, applying his distinctive sensibility to the creation of high-drama spaces that reinforce the message of a particular brand. Matthew Rolston packed the cavernous JF Chen gallery in Hollywood on Friday night to introduce L.A. to his latest project, “Talking Heads: The Vent Haven Portraits,” a series of photographs featuring all-too-human ventriloquist dummies. Much of the early coverage of the book has focused on the eerie and absurd qualities of the dummies (the Huffington Post declared them “creepy”), but through the 5-by-5-foot portraits on view at JF Chen, Rolston was able to reveal much more. Most evident: The large format of the portraits emphasizes the human hand behind each doll face: the rosy cheeks, the bushy brows, the eyelashes brushed on, one by one. Where skin has cracked, where painted makeup has chipped, where the 24/7 smiles yield to the realities of time, Rolston’s subjects feel the most human. And when you take a step back and consider the photographer first gained famed through celebrity portraiture, the work takes on another layer of humor. Friday night Rolston signed books while fans circulated in a crowd that included Diane Keaton and John C. Reilly. 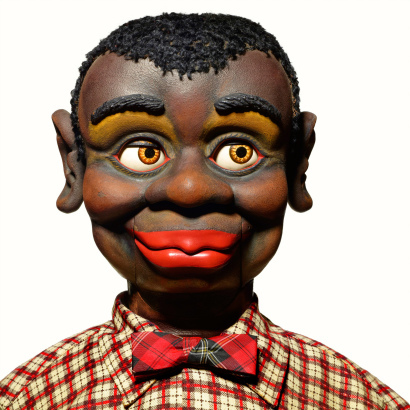 A short film explained that the stars of the show live at the Vent Haven Museum in Fort Mitchell, Ky., where the collection of ventriloquist dummies tops 700 and dates to the 19th century. Rolston photographed his subjects on site and, given the outsized personalities with which he was working, deployed a relatively simple approach: one camera, one angle, one light source. The results are mesmerizing. You can’t help but root for dummies that spent their working lives under command of a master. Here they loom larger than life, in the spotlight, flying solo on a new stage. 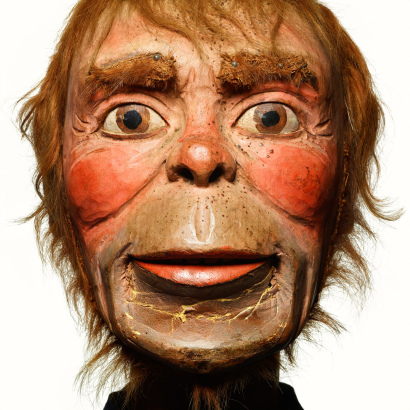 When photographer Matthew Rolston walked into the Vent Haven Museum in Fort Mitchell, Kentucky, in 2009, the crowds of huddled ventriloquist dummies on display reminded him of retired performers still awaiting a cue. “It was the best casting call I’ve ever seen,” he recalls. Rolston, who usually photographs entertainers such as Madonna and Beyoncé, was moved by the pathos of these antique wiseacres, toffs, and geezers. “To me, they were amazing abstractions of humanity, and because of the mileage on them, they have all kinds of issues of mortality attached,” he says. Rolston made about 200 large-format portraits of dummies dating from the 1820s to the 1980s. Around half are collected in the book Talking Heads: The Vent Haven Portraits, published by Pointed Leaf Press. Matthew Rolston’s photographic portraits of ventriloquist dummies (clockwise from the top left): Jonathan Jones, Powers Girl, Jasper, and Hook Boy, all 2010. Producing an artist’s book is a first for the photographer, who got his start shooting for Andy Warhol’s Interview magazine in the 1970s. 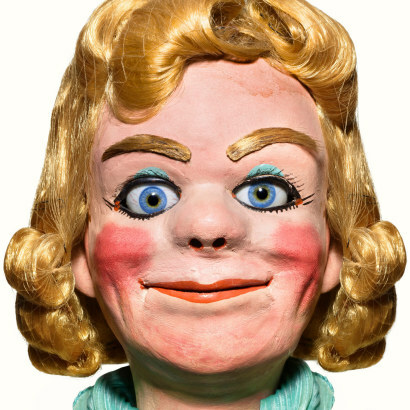 But aside from the bug-eyed blonde dummy in Powers Girl (all works 2010), whose wide mouth and glued-on eye-brows suggest a simpleton version of Warhol’s Marilyn, most of Rolston’s subjects aren’t very glamorous. With wide, weary eyes and limp hair, Pancho suggests a hapless Willy Loman type posing for his driver’s license, and Hook Boy “looks like he was knocked down, drowned, left for dead, put back together – maybe by somebody’s child – and repainted,” Rolston says. To help the photographer get the right expression for each portrait, Vent Haven curator Jennifer Dawson stood just outside the frame with her arm inside each dummy. Working the rows of keys in the puppets’ heads, Dawson focused eyes, protruded teeth, and made hair stand on end. “ I was always looking for this dimension moment,” says Rolston, “when they seem to bloom as if they’re alive. For the first time in his 30-year career, portrait photographer Matthew Rolston is dipping a toe in the world of fine art. His new book and series of prints, “Talking Heads: The Vent Haven Portraits” employs his signature lighting techniques, but rather than shooting celebrities or movie stars for which he is known, Rolston looked to dummies. Officially classified as ventriloquial figures, the 103 dummies that make up Rolston’s book hail from the Vent Haven Museum, the sole museum dedicated to their preservation. It is located in Fort Mitchell, KT. Sitting high above Sunset Boulevard in his pied-à-terre, Rolston flipped through the book, released in January, and spoke about its coming Los Angeles gallery debut, set for Friday night at JF Chen. Having built his reputation in portrait photography, Rolston said he’s had his fair share of critics in the fine art world, especially considering his late entrance. “To a dealer I’m not this young, fresh talent eager to pay my dues,” said Rolston. Nevertheless he’s acquired some influential fans, including actress and art collector Diane Keaton who will co-host the Friday event, and the Museum of Contemporary Art’s director and recent Los Angeles transplant Jeffrey Deitch. Rolston bankrolled this project personally, another first for him. Because he was not on assignment for a client, he also established a particular set of boundaries for himself. He used only one light, one camera, one lens and one background during his shooting. He allowed himself fifteen to twenty minutes with each dummy, which range in age from the year 1820 to 1989. The six five-foot square prints will not be available for purchase at the event Friday night, but the book, which retails for $75, will be. 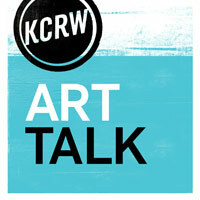 Rolston began his career at Andy Warhol’s “Interview” magazine, hired by Warhol himself. He went on to shoot over 100 covers for “Rolling Stone” magazine. Rolston, a Los Angeles native, resides in Beverly Hills. This book has been haunting me since I laid eyes on it earlier this year. These large closeup “portraits” by Matthew Rolston of ventriloquist dummies at the Vent Haven Museum in Fort Mitchell, Kentucky, make you realize the individuality of these (largely) arcane performers that convey their age through cracks, wear, and other curious details. The brief history of ventriloquists and their partners at the back is very insightful, and may I suggest pairing this book with Marco Anelli’s Portraits in the Presence of Marina Abramović (Damiani, 2012), because the inadvertent similarities and parallels will kind of blow your mind. Matthew Rolston has made a career of taking photos of famous peoples’ faces. He’s shot Michael Jackson, Taylor Swift, Johnny Depp, Lady Gaga – you get the picture. But his favorite portrait subjects have no clout at all. In fact, they don’t even have a heartbeat. He knows those things well. Much of his work is glossy, loud, and laboriously styled. When you see the simplicity of the Vent Haven portraits, it’s hard to believe you’re looking at the work of the same photographer who turned in a candy-colored portrait of Nicki Minaj, fractured like a kaleidoscope. Although photographer Matthew Rolston has built a career on entertainment portraiture, advertising, and music videos, he suddenly found himself looking for a different outlet in 2009. 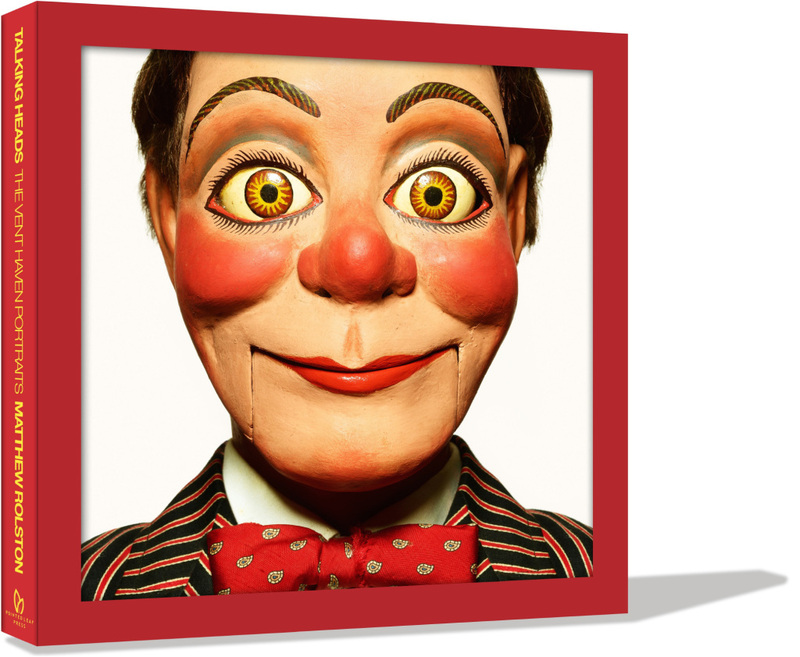 The project turned out to be a series about ventriloquist dummies from the Vent Haven Museum, now a 224-page book titled Talking Heads: The Vent Haven Portraits, published by Pointed Leaf Press. Rolston mentioned that once he started thinking about tackling an independent project, he had a hard time focusing on anything else. “I’m the kind of person, once my ‘antenna’ is up, I immediately start ‘receiving,’” he wrote recently, via email. What perked the antenna this time was a New York Times story by Edward Rothstein about the Vent Haven Museum and in particular a photograph of one of the dummies he saw, and upon visiting, he felt a kind of kinship with the dolls. Because many of the dummies are fragile, Rolston did the shooting on-site. Choosing which subjects to include was complicated since there are more than 700 figures on display. He photographed more than 250 and then edited those down to the 100 strongest, “many a Sophie’s Choice,” said Rolston. “I wanted to photograph the figures that ‘spoke’ to me in a more personal way. 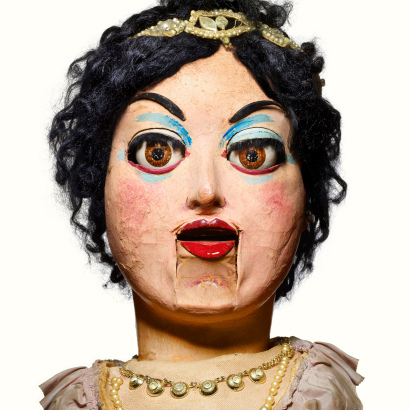 This collection of portraits is not about recording the history of ventriloquism. Instead, it is a personal response to the emanations of humanity that come from these terribly evocative inanimate objects,” Rolston wrote. Reaction to the project (Rolston is still looking for a gallery to show the work) has been overwhelmingly positive, though Rolston said many people still have negative reactions to dummies. “It seems that the image of the evil or demonized dummy is very much part of popular consciousness due to a number of rather clichéd books and films,” he explained. Rolston mentioned that from his other work he is a “connoisseur of faces” and approached the portrait sessions similar to the way he would with human beings. 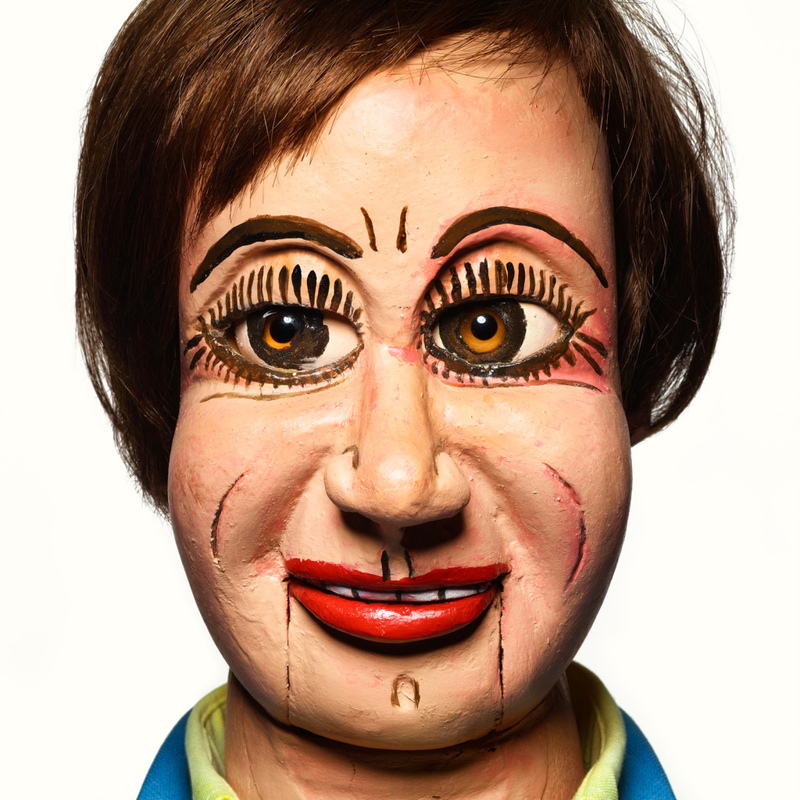 A photography book and upcoming exhibition by noted celebrity photographer and filmmaker Matthew Rolston exposes the power and humanity of a very unusual subject: ventriloquist dummies. Using techniques developed throughout his career, an inspired Rolston photographed more than 100 dummies to create an intriguing series of head shots that reflect traditional, gimmick-free portraiture. Dedicated to ventriloquism, Kentucky’s Vent Haven Museum, and its more than 750 dummies, provided Rolston’s casting list. “I’m known for my work with entertainers, and after seeing images of the figures at Vent Haven, I couldn’t wait to ‘meet’ them. I love faces, and this was without a doubt one of the greatest casting calls I’ve ever seen, and with some of the most fascinating hair, makeup, and wardrobe of all time,” said Rolston. Certainly, Talking Heads has a lot to say about identity, eccentricity, celebrity, and ironically, humanity—topics with which Rolston is well acquainted. After all, he was discovered by Andy Warhol and began his career taking photographs for Warhol’s Interview magazine. Since then, Rolston has shot for Harper’s Bazaar, Vogue, and Vanity Fair, among others. He’s also a music video director, having worked with the likes of Madonna, Janet Jackson, Christina Aguilera, and Beyoncé. Visit celebrity photographer Matthew Rolston’s website and you’ll see pop icons like Michael Jackson, Lady Gaga, Taylor Swift and Nicki Minaj looking as glossy smooth as a porcelain doll. Yet his photographs of dolls themselves are not so forgiving. 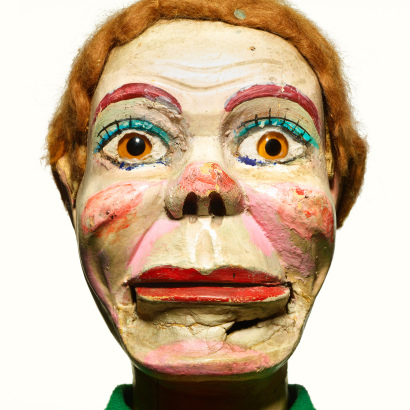 Far from the gloss of celebrity glamor, Rolston’s photographs of ventriloquist dummies show the crackled paint and decayed wood that has phased the physical faces themselves, though not the smiles painted upon them. Rolston, who was discovered by Andy Warhol, snapped 100 dummies at the Vent Haven Museum in Fort Mitchell, Kentucky. There is an eerie beauty to the silenced puppets, their expressions somewhere between entertaining and grotesque. Rolston captures the dummies’ “head shots” straight-on against a white background, treating the wooden dolls as stars of another era. While the beauty of Hollywood’s most stunning starlets will eventually fade, these ventriloquist dummies forever keep smiling, although this eternal existence is far from beautiful. The photographs are compiled in the book “Talking Heads: The Vent Haven Portraits,” which we predict will catalyze superbly bizarre coffee table small talk. For his first personal assignment, celebrity photographer and director Matthew Rolston shot portraits of a different breed of entertainers — ventriloquist dummies. 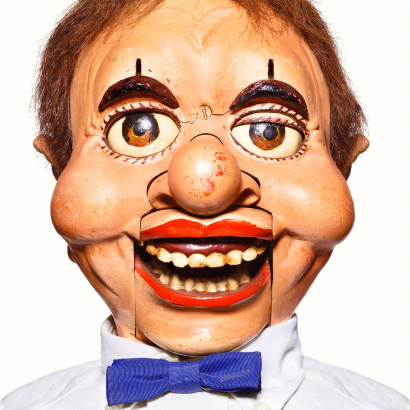 In 2009 he read an article in the New York Times about the Vent Haven Museum, which houses retired ventriloquist puppets. Intrigued by the story, Rolston flew to Fort Mitchell, Kentucky, by way of Cincinnati, to visit the one-of-a-kind museum. The faces of the little figures fascinated Rolston. “I’m not a ventriloquism person,” Rolston said. But at the core of what he does with celebrity photography is the human face. 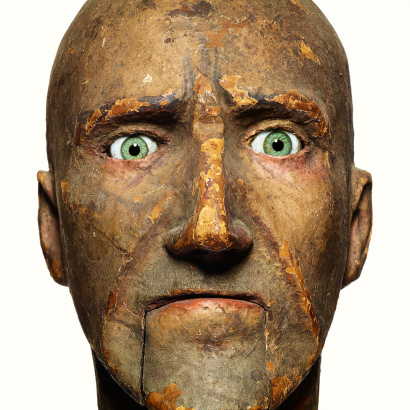 And “these were the most fascinating faces.” The museum agreed to give him access to the figures, and his project began. With a crew of five people, a film generator truck driven all the way from New York, a backdrop, lighting and the help of the curators, the puppets’ photo shoot was ready to begin. Based on his personal response to the puppets, Rolston selected 100 of the nearly 750 displayed, most from the 1820s to 1980s, he said. Anyone handling the puppets had to wear cotton gloves to prevent damage. In much the same way that he would direct a Hollywood star, Rolston manipulated the miniature faces. Many of the figures’ mouths, eyelids and eyebrows move; some have tear ducts for crying and holes in their lip for smoking; some can wiggle their ears. The project freed Rolston to work without an agenda for the first time in his career. Andy Warhol discovered him and hired him to shoot a portrait of the then relatively unknown film director Steven Spielberg for Interview magazine. Soon after, he began shooting for Rolling Stone magazine. Since then, the highly renowned photographer has shot for the likes of big-name magazines such as Harper’s Bazaar, Vogue, W, GQ, Esquire, and The New York Times Magazine. He also has directed award-winning music videos for the likes of Madonna, Janet Jackson, Beyoncé and Marilyn Manson. If you are a Hollywood hopeful and you find yourself in front of Matthew Rolston’s camera, you can be assured of two things. One, that your career is no longer in a holding pattern. Two, that you are going to look… fascinating. Ever since Andy Warhol set him to work on Interview magazine, Rolston has spent his days making immortal images of iconic celebrities. Over the past three decades he has captured everyone from Depp to Dylan in portraits that are frequently glamorous, occasionally gritty, and always galvanizing. His September 2010 Rolling Stone cover of the cast of HBO’s True Blood – naked and blood-splattered—caused a sensation. So it shouldn’t come as much of a surprise that he has turned his lens to a group of seasoned local entertainers: the quiet, immobile inhabitants of the Vent Haven Museum in Ft. Mitchell. 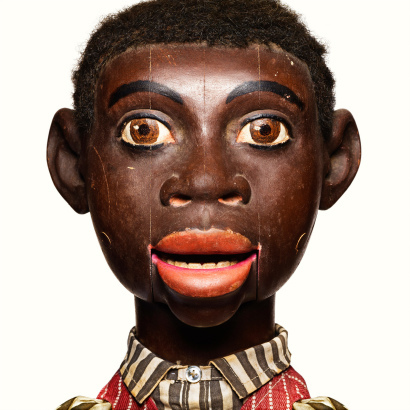 Rolston has photographed the ventriloquist figures that make their home in the museum’s four small buildings for Talking Heads: The Vent Haven Portraits. The book, released by Pointed Leaf Press in December, is his first fine art project. It’s a dramatic departure for a man known for breathtaking magazine covers, music videos, and advertising images. Bringing Talking Heads to life was “a passion project,” he says. And just as challenging as shooting Johnny and Bob. How did you get interested in Vent Haven’s ventriloquist figures? How did you even find out about the place? I’m an avid New York Times reader. In 2009, I think, there was a piece in the Style section about three museums, one of which was Vent Haven. And on the front page of the section, below the fold, was an image—these colorful faces. I had no idea what they were; I didn’t know very much about ventriloquism. But I immediately zeroed in on that image and I was taken by it. I read the article and went online and looked at the museum’s website. I became a little bit obsessed with the museum’s website; I looked at it a lot. I flew from L.A. to Cincinnati just to go to the museum, and I talked with the board of directors about allowing me access to do the photographs. I just knew: I’ve got to get those faces. It has taken a while to bring the book out. This project for me [has been] years of dedicated effort. We did the pictures in 2010, and went back [in 2012] to photograph memorabilia. The time in between was spent building the digital files—because the kind of photography I do involves image management and a certain amount of retouching. In this case we weren’t taking away flaws, we were actually bringing out texture, cracking, color variation. It was as fine-tuned as a painting, each one. This project seems like a huge departure for you. In many ways it is. It’s the first time I’ve done a fine art project. My career has been photographing beautiful celebrities—entertainment portraiture, that’s what we call it. Magazine covers, advertising campaigns, always with very beautiful and fascinating entertainers. These figures are also entertainers. So, in a way, I’m doing what I’ve always done: making portraits of entertainers. It’s interesting you say that, because Vent Haven has a lot of dummies that are genuine celebrities—figures like Charlie McCarthy and Jimmy Nelson’s dog, Farfel. But you didn’t photograph any of those. It wasn’t intentional; I just went with my gut response. I looked at them as if they were human subjects and chose the ones that I felt a connection to. I didn’t feel that connected with Charlie McCarthy or Farfel. As someone who is a portraitist, faces are stories to me. This is the best lineup of faces I’ve ever seen. You worked with Andy Warhol on Interview magazine, and it seems to me that there’s something about this project that has a Warhol sensibility to it. I think the thing it shares with [Warhol] are that these are kitsch, or would be considered by many people to be kitsch. And Andy collected kitsch—things like 1930s cookie jars. Also, he appropriated images from pop culture into fine art. And he was obsessed with faces— huge, confrontational faces, cropped very tightly, often with no shoulder line, just a square. On a huge scale. I gravitate to some of those things. I understand that, apart from the book, you have made exhibition prints of these photographs, even though you don’t have an exhibit in the works. Why was it important to make the prints? The ultimate expression of this work is not the book, it’s the prints. They’re like paintings; they’re on rag paper, very richly colored. And the prints are five feet square. It’s to examine something, to see the small thing made huge. They take on a different quality. When you stare at them…I compare it to when you look at a mandala—a Tibetan meditation diagram. These to me are meditation objects, and what I’m meditating on is the human condition. The passage of time and mortality. You had to photograph the figures in the museum. Did that present technical challenges? With my work, I often build sets [and] have very complicated lighting or special costumes. Here, I wanted to strip that away because the figures themselves are so theatrical. I decided I would only shoot one composition—frontal-faced. I would only use one light source, only one background—white—only one lens, one camera. I wanted to use a digital camera with the highest resolution you can have. That takes a lot of light to get the small aperture on the lens, which creates the incredible depth of field and sharpness. So you have to use strobe lights, and strobe lights take a lot of power. If I tried to plug my lighting system into the Vent Haven Museum it probably would have blown up. So I had one of my crew drive a movie generator truck from New York City to Ft. Mitchell. It looks so simple, but there’s a lot of time and effort to produce something like that. So, if you were categorizing these in conventional art terms, do you consider what you’ve done to be portraits or still lifes? These are portraits, no question. I approached [the work] exactly as I do when I photograph humans: to instinctively find a moment of connection. I truly love these figures; I know them as people. There is history that comes out, that you can feel. I feel very protective of them. Many people have said to me—the cliché reaction—“Oh, they’re creepy, they’re scary.” Not to me. They were like children; very dear and wonderful creations. I think that one of the things that happened in my relationship with the people at the museum is they understood I felt that way. And of course, they feel that way. 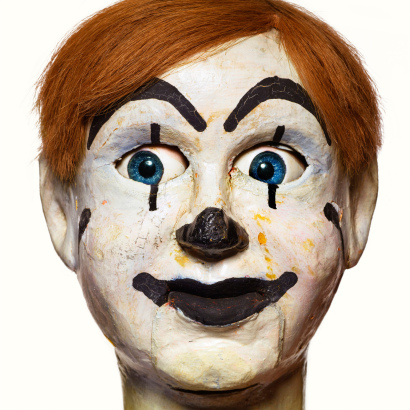 Renowned celebrity photographer Matthew Rolston’s new book “Talking Heads: The Vent Haven Portraits” captures photos of retired ventriloquist dummies. Rolston, who has photographed stars such as Angelina Jolie, Johnny Depp, Beyoncé, and Oprah Winfrey, found the puppets housed at the Vent Haven Museum in Fort Mitchell, Ky.